Kapture is a masterfully performed fusion of jazz and Indian classical musics with a sprinkling of other influences from across the globe. 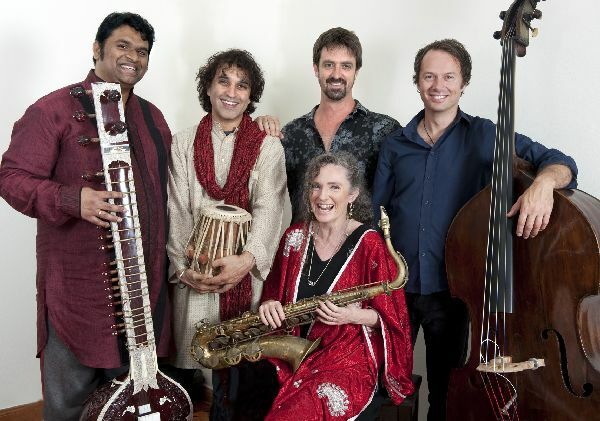 Sandy Evans (alto and tenor saxophone), Bobby Singh (tabla), Brett Hirst (double bass) and Toby Hall (drums and percussion) are joined on four of the twelve tracks by vocalist Sarangan Sriranganathan. Inspired by the life of Ahmed Kathrada, a South African anti-apartheid activist who was imprisoned for 26 years, Kapture began as a solo dance work performed by Liz Lea, and the music was developed from the initial 30 minute score composed by Evans et al. The generous liner notes that accompany the album explain how each of the pieces relates to this story. It’s interesting to see the many ways that a narrative or theme can be used as compositional inspiration, and on this level Kapture really excels. The Censures uses Kathrada’s prisoner number as a rhythmic base, some pieces are lyrical representations of an idea or event – Lokasvatantrataa is a Sanskrit phrase, sung by Sriranganathan, that means freedom – while others are more abstract musical interpretations of loss or hope. Despite this, the success of Kapture as a stand-alone album comes down to both the strength and beauty of the performances from all of the players and the shifting musical landscapes that are presented. The twelve compositions, most of them by Evans, explore a great range of moods, from meditative to lyrical to energetic to dark, and the vocal presence of Sriranganathan extends this palate even further. There is a sense of effortlessness that emanates from this music: perhaps it emerges from the (sometimes simultaneous) combination of two modes or approaches: simple, beautiful phrasing and lyricism versus gloriously hard and technically demanding rhythmic flourishes. The album opens in the first mode: climbing out of a rich wash of tambura harmonics, Sandy Evan’s soprano saxophone on Passive Resistance, No Regrets has a soaring quality that is one of the highlights of this album. Elsewhere, the improvisations of Evans, Singh, and Sriranganathan, when he deploys vocables, exemplify the virtuosic energy that is a key resonance between jazz and some forms of Indian classical music. For the most part Evans’ playing is restrained: this isn’t to say it’s not rambunctious and virtuosic, but rather that the requirements of each piece are more important than a showcase of individual brilliance. So instead of being vehicles for musical explorations by the soloists, the compositions on Kapture have a finely balanced group dynamic. Rarely do we get to hear Evens’ jazz roots, a feature of her trio with Hirst and Hall as members. Some of the percussion in the more meditative moments of Kapture is mind-blowing, particularly on Explosion of Memory. I’m not sure how these sounds are produced, but they move the recording into sonic regions beyond the usual reach of the ensemble. The interplay of the two percussionists Singh and Hall is another lesson in restraint. Their partnership is foregrounded on Robben Island, where Hall’s cymbals cushion Singh’s more complex rhythmic permutations. On an album with an abundance of memorable bass ostinati, the second last track, Peace, stands out. Hirst jumps between ‘a rhythmic pattern conceived by South Indian mridangam maestro Guru Karaikkudi Mani’ and doubling the melody with Evans. The final solo tabla piece from Singh – Some See Stars – brings the album to a conclusion on a distinctly hope-filled cadence, one that I think defines Kapture as a whole.